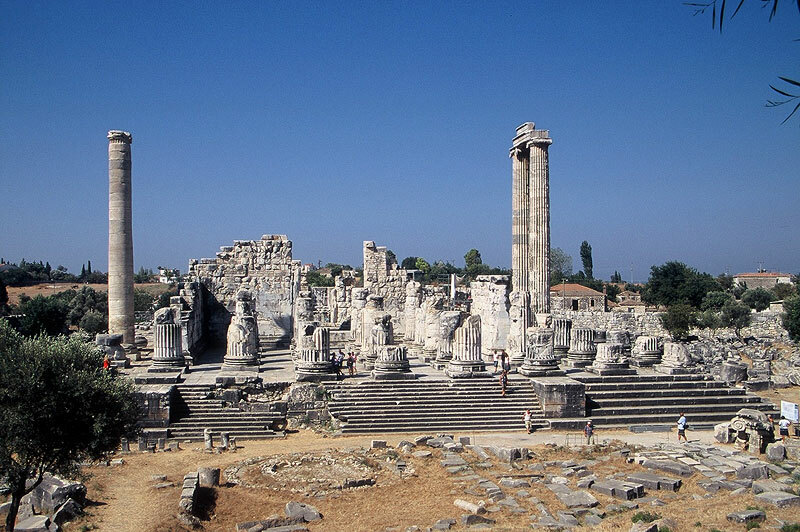 Didyma/Branchidai is situated on the west coast of modern Turkey within the present-day town of Didim, about 20 km to the north of ancient Miletus. There lied a sanctuary and oracle of Apollo, connected with Miletus by a paved road. The Sacred road went through a small port, called Panormos, from where the visitors arrived to the oracle. The last part of the processional route was adorned with statues, dated to the archaic period. 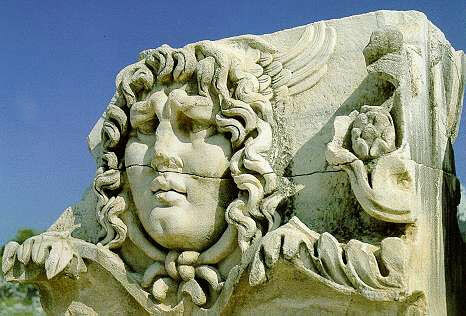 Didyma was one of the biggest sanctuaries of Asia Minor. It included one of the most famous oracles of the ancient world, equally important to the oracle of Delphi in main Greece. The temple, which was widely known as Didymaion was one of the most important monuments of antiquity. Although the ancient authors refer only to the temple of Apollo, epigraphic inscriptions and works of art of the hellenistic period testify the existence of other cults, namely the cult of Artemis, Zeus, Leto, Hekate, Aphrodite and Tyche. A cult place, which included a grove and a spring was given to the Ionians, who settled in the area. The excavations revealed that the first building of the sanctuary, the so-called cella I, was dated around 700 BC. In the late 7th and 6th century BC, Didyma reached the peak of its prestige and its influence in the political evolutions in the Aegean. During this era, the Egyptian pharaoh Necho and the king of Lydia Kroisos send dedications to Apollo. In the middle of the 6th century BC the rebuilding of the monumental temple began, which consisted along with the Artemision in Ephesos and the Heraion in Samos the biggest and most important Ionic temple of the archaic period. The sculptural decoration of the architectural members of the temple is of particular interest. The lower drums of the columns in the pronaos were decorated with relief figures presenting dancers, while mythological creatures and the apotropaic figure of Gorgo decorated the architrave of the temple. The temple was dipteral and included a deep porch (pronaos) and an open-air cella. At the back of the cella there was a naiskos (small temple), where the cult statue of Apollo made by the sculptor Kanachos of Sikyon was displayed. At the east in front of the temple there was a circular altar, a fountain and two stoas. All the buildings are dated to the 6th century BC and served the needs of the sanctuary. Didyma were plundered by the Persians in 494 or 479 BC, the temple was destroyed, while the cult statue of the God was transferred to the east. During the 5th century BC the sanctuary declined, while a new era for the building activity at Didyma began after the expedition of Alexander the Great to the East. After the middle of the 4th century BC the construction of the temple of Apollo began, with the aim of becoming not only one of the most glorious buildings, but also famous all over the ancient world. The architects of the monument were according to the tradition Paionios from Ephesus, who had also worked in the Artemision of Ephesos, and Daphnis of Miletus. The construction of the temple continued until the 2nd century BC. The architectural decoration was completed during the roman imperial period, although many parts remained unfinished. The new Didymaion adopted in broad outlines the design of the older archaic temple. It was an Ionic dipteral temple raised on a high stepped crepidoma, which included interior spaces of different cult use. There was a monumental staircase in the façade, which led to a deep pronaos with four rows of columns. 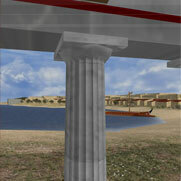 In the small hall between the pronaos and the cella, there were two Corinthian columns. This area was the adyton and it was designed as a kind of stage, probably to serve as the spot from which the prophetes of Apollo announced his oracular responses. The east wall of the chamber was interrupted by three doors, between which a pair of Corinthian half columns was formed and from there a large staircase led to the cella. At the sides of the adyton, staircases with ceilings decorated with meander patterns, which are referred to as labyrinths, led up to the roof of the temple and were probable used for cultural ceremonies. Under the staircases, there were vaulted passageways-tunnels, creating a mystic environment. These vaulted tunnels facilitated the entrance to the pronaos and the huge cella. The cella was at a lower level than the pronaos and the adyton. It was formed like a great open air courtyard, where there were sacred laurel bushes and a spring of holy water. The walls of the cella were very high, and were reinforced by pilasters, which stood on high pedestals (socles) and bore relief frieze. At the back of the cella stood the Ionic tetrastyle Ionic temple with the cult statue of Apollo, which king Seleucus I had returned to the sanctuary. The temple’s architectural decoration presented a rich variety, combining Greek themes with motives inspired from the East. At the west side of the temple the ruins of the stadium of the late Hellenistic period were located, where the athletic contests took place during the festivals in honor of Apollo Didymaios. The festivals were enacted around 200 BC and were held every four years. Numerous and various buildings, big and small completed the facilities of the complex. They served the administrative offices, the storage, the cult or just the embellishment of the sanctuary. Some of them, had already been constructed in the 7th century BC and they remained in use until the 4th century AD. The sanctuary flourished during the Hellenistic period and developed relations with the Hellenistic sovereign, the Seleucids and later the Ptolemies. During the Christian era a basilica was built at the adyton of the temple, while on the 7th century the large pronaos was altered into a fort. In 1943 an earthquake destroyed the walls and the and the colonnades. The excavating research in the site were made by the French and the German archaeologists, while restoration works began in 1906 with the rebuilding of the wall of the adyton to 5 m. height. Since 1992 the German archaeological Institute had a programme for the secure and perfect technically restoration of the temple, while the archaeological research in the area of Didyma continues up to date.